Seventeen years ago, three friends met for coffee at a small café overlooking the Florida coastline. One thing led to another and their conversation sparked an idea … a very big idea. 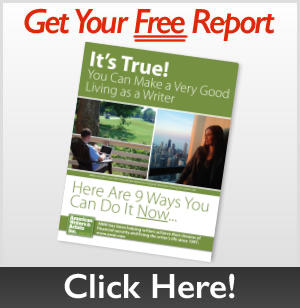 You can make an excellent living as a writer … all you need is someone to show you how. Since then, their idea has prompted life-changing moments for writers across the globe — many of whom now live hassle-free, writing for excellent money and doing it when and where they want. The idea that you can make a great living as a writer, dictating your own projects, and working from home or a location of your choosing strikes a lot of people as impossible. That’s because they still subscribe to the old stereotype that writers are “starving artists” — though nothing could be further from the truth. Our job is to help those folks — and you — discover all the avenues toward paid writing opportunities. We’re committed to teaching you how to be a better writer so companies that pay well for writing work will clamber to hire you. And when they do, you’ll have the means to build the lifestyle of your dreams. You’ll be in charge — nobody has a boss in this world. You’ll work only when you please, whether that’s just early in the morning so you have the rest of the day free, or even just a few days a month so you can spend most of your time traveling, relaxing, or simply enjoying more time with your family. Whatever YOU want, we’ll show you how to live it by getting paid to write. It’s our goal to teach you the best secrets for writing well, as well as help you take advantage of all the money-making opportunities available to writers who know these secrets. In The Barefoot Writer, you’ll learn about everything you need to know to launch a successful writing career, including figuring out which writing path is best for you, streamlining your writing ability so you write more in less time, and connecting with a whole industry of experts who will teach you where to find the best projects and what to charge. 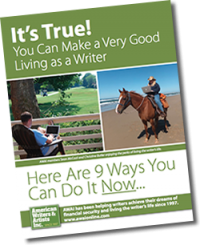 To give plain and practical help, hints, and suggestions about how to create a comfortable, even dream lifestyle as a paid writer. To collect and publish the experiences, experiments, and observations of literary people, for the benefit of all writers. To aid new writers in reaching the public by advising them how to make their written words salable. Through our parent company, American Writers & Artists Inc., we have 17 years of experience leading writers to the lives they’ve always dreamed of. Welcome to the Barefoot Writing World. It’s a freedom-filled, independence-driven departure from the ordinary, and it’s fueled by writers like you. We’re here, ready to help you in any way possible to make your write-for-a-living dreams come true.